Vitagene was launched in 2014 in San Francisco, CA, as a privately held enterprise dedicated to genetics, healthcare, nutrition, vitamins, diet, and exercise. The main idea behind the company is that science, convenience, encouragement, and quality are the key factors in reaching our personal health goals. Vitagene believes that through the latest genomic research and state-of-the-art technology, it may not only help its users improve their health but also reshape the entire landscape of the healthcare industry as we know it. So, whether you’re interested in your genetic health, ancestral origins, personalized diets, recommended supplementation or exercise plans, read our in-depth Vitagene review and learn if it’s the right fit for your particular needs and expectations. Placing an order – Once you decide to purchase the test, you can place your order on the official website. The sample collection kit will be shipped to your home address within 3-5 business days. Vitagene accepts MasterCard, Visa, Discover, American Express, and Diners Club. Collecting your sample – Every testing kit comes with user-friendly instructions that will guide you through the entire collection process. The kit uses cheek swabs and you should be able to collect your sample within 2 minutes. Note that you have to activate the kit online only if you purchased it on Amazon.com. Mailing the sample back – Once you have your DNA sample ready and stored in the provided container, you can simply mail it back to the Vitagene’s processing lab using the prepaid return mailer. Filling out the online questionnaire – While you wait for your report to arrive, you should fill out Vitagene’s questionnaire in order to personalize your results to your medical history, lifestyle, and medications. Inspecting the results – Your final report should be generated in around 4-6 weeks after your personal testing kit arrives at the lab. Once your results are ready, you’ll receive a direct email from the company notifying you that you can view them on your personal online dashboard. Your raw DNA file will also be provided upon request. 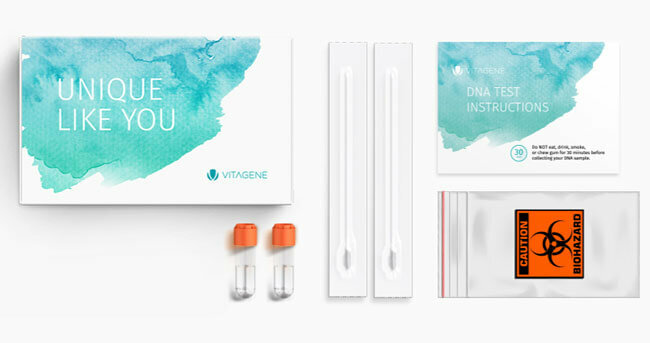 Vitagene provides a unique mix of testing solutions, showing us just how much we can improve our lives through DNA testing. It offers an unprecedented array of testing options and an easy way to start progressing toward a healthier lifestyle. Health Report + Ancestry (79.00$) – This test represents a bundle of different analyses we can honestly say we’ve never encountered before. Your final report will give you detailed information about your ancestry breakdown but also make recommendations regarding your supplementation, fitness, and diet. The ancestry portion of the results will solely focus on the ethnic percentages of your ancestry by region, so you can’t really expect to learn more about your direct maternal and paternal lines. The fitness section will create a personalized exercise program for you based on your muscle strength, weight response to exercise, exercise behavior, muscle cramps, power vs. endurance exercise, and blood pressure response. The diet part of your report will investigate how your DNA affects your body’s capability to interact with food, specifically, gluten sensitivity, weight regain after dieting, emotional eating, sodium intake, fat intake, alcohol metabolism, obesity risk, triglyceride levels, cholesterol levels, and lactose sensitivity. The personalized supplementation plan is pretty self-explanatory. Health Report (49.00$) – If we take the ancestry breakdown out of the picture, this testing option offers the exact same results as the previous one. The other major difference is procedural in nature as Vitagene doesn’t send out DNA testing kits when you buy this test. 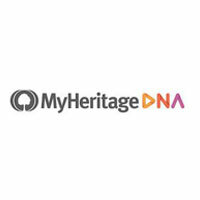 The only way you can access this service is by transferring your raw DNA data from MyHeritage, AncestryDNA or 23andMe. The results are usually ready within 2-4 business days. Smart Supplements – This is a subscription option that allows you to maintain optimal nutrition based on your DNA but also medications, lifestyle factors, health goals, and medical history. The “Essentials” subscription (49.00$ per month) includes the 4 most important dietary supplements for you while the “Premium” subscription (79.00$) contains all the supplements you need for optimal health and well-being. Wellness Bundle (149.00$) – This option combines Health Report + Ancestry with the Essentials subscription to Smart Supplements (1 month). Vitality Bundle (245.00$) – This is essentially the Wellness Bundle with a 4-month subscription to 4 personalized supplements. Once your test results are available, you can also order your personalized supplements from Vitagene. The company only sells bioavailable supplements tested by independent third parties and made in the US using the hypoallergenic manufacturing method. None of the supplements contain hydrogenated or trans-fats, eggs, nuts, wheat, and gluten. For any additional information, you can contact Vitagene’s customer support by email, phone or live chat. The support hours are Mon-Fri 9:00 AM – 6:00 PM PT. Vitagene takes your privacy and the security of your personal information very seriously. The company implements all the industry standard security practices when it comes to storing and protecting your DNA file, test results, and any additional data you provide. It is important to note that DNA files don’t contain any information that can positively identify you as an individual. Additionally, Vitagene will never sell your information or share it with third parties without your explicit consent. Vitagene currently only accept orders made from addresses in the US. However, you can always join its international waiting list by sending an email to its customer support. After your order is received by the company, your personal DNA testing kit will leave the warehouse within 3-5 days. The arrival depends on your address, specifically, your distance from the said warehouse. As we already mentioned at the beginning of this Vitagene review, the testing kit comes with a prepaid mailer, so you won’t have to worry about any shipping costs when returning your DNA sample to the processing lab. In our eyes, Vitagene left the impression of a jack of all trades, master of none. We feel like the service tries to provide everything at once without necessarily focusing enough on each particular segment of DNA exploration. On the other hand, this can also be a good thing. The company can provide you with basic information about your history and fitness & health and also give adequate recommendations without decimating your monthly budget. 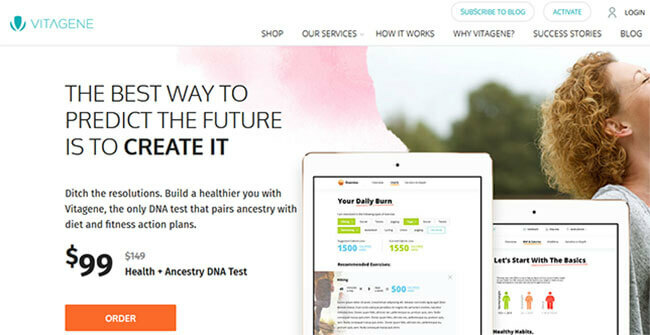 So, if you want in-depth information about your ancient relatives and ancestral lines, you’ll go to a company that specializes in genealogy and ancestry DNA research. If you want a comprehensive genetic health report, you’ll find a company that specializes in that field. But if you want a little bit of both without necessarily going too deep into either area, Vitagene is the right choice for you. You’ll get accurate and reliable basic information on both fronts and definitely save some money along the way. Our ratings are the result of an objective and independent evaluation of Vitagene, generating the final rating that reflects the overall quality of the company. Ratings may change as the service changes. Vitagene user rating based on 9 user reviews. Horrible customer service. When I complained about it, I was answered by the same person who was rude to me in the first place. Avoid. I have had no similar issues with 23 and me or Ancestry. Save your money- Scam reportThe DNA testing is fine. . . BUT save your money on the "Wellness" report. You can get better information off the internet. All you get is diet information such as you need to drink 7 glasses of water a day, and salt could make your blood pressure rise. Once they get your money there are NO refunds, all Vitagene want to do is sell you supplements and argue with you about there lame report. The report is not even worth $5.00 let alone $49.00. if you want a good report go to Promethease.com and pay $5.00 for a much better report with some information. Thanks for that info! Waiting on the results for Promethease - uploaded 2 data files for only $16 usd. Reasonable prices compared to some other dna testing companies I've seen. Really hate the fact that you just can't order health test without having dna data already. We found 0 verified Vitagene discounts for April, 2019. There are no Vitagene coupons or discounts right now. If you like Vitagene but aren’t sure whether they are truly the ideal choice for you, you may want to take a look at our comparisons below to discover if one of their competitors is more suitable for you.